During the welding of plates to fixed structures, buckling stress is produced. 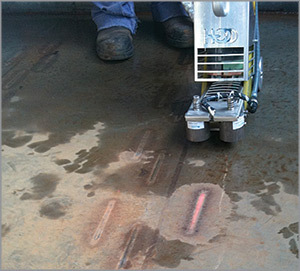 In order to eliminate this distortion, different traditional deck and bulkhead straightening techniques are employed: welding of beads in non-visible areas, cutting and re-welding of plates, and stress relieving using flame heating. These techniques are big time consumers, costly and do not provide any added value. Improving the efficiency of this process is paramount. 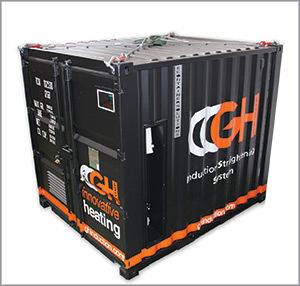 The GH IA Induction Straightening Solution (ISS) provides a simple, flexible, low-maintenance alternative to traditional deck and bulkhead straightening techniques. The quick, clean induction heating system rapidly generates heat with precision to relief the stress and straighten the plate. The ISS System is housed in an all-in-one, portable container. The container is placed at a suppport beam; eyebolts are provided for easy movement. With just a tool change, the equipment can be used in either horizontal or vertical position. The system can be placed on both flat and tilted surfaces. The ISS System is designed for marine environments and meets both IP55 and AISI1316 requirements. The cabinet is made of stainless steel and the induction process requires no expendable materials. System operators can master the three basic steps with just a few hours of training. Program selection based on plate thickness. The system handles steel plates with thickness of 4 to 20mm, and aluminum plates with thickness of 3 to 6 mm. Press the start buttom to begin the program. The advanced induction technology generates the required amount of heat rapidly, without exceeding the Curie temperature.